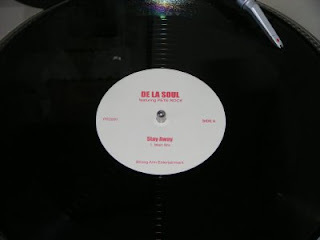 This is the third in my series of Dodgy Bootlegs and this one is From about 1999 and is De La Soul featuring Pete Rock's dope Stay Away. I picked this up in the now closed down Mr Bongos in London's SoHo. If I remember correctly it cost about £6 and was well worth the money. Its a Pete Rock produced track with De La dropping the usual lyrics but it also heavily features long time Pete Rock collaborator Rob-O despite him not being credited on the label. A dope beat if somewhat slower than Pete's usual jam but well worth checking out. I am unsure where this was originally supposed to end up but it did appear again on vinyl a few years back with the Pete Rock produced compilations For Pete Sake:The remix years which featured a number of Pete Rock produced tracks. It also showed up in 2004 on the Days Off Promo CD which came out just before the Grind Date and was distributed by Hiphopsite.com. However it didn't appear on the Grind Date album.